The torque and fuel consumption of diesel, the appeal of petrol. VCRi reduces fuel consumption substantially in all driving cycles with respect to equivalent fixed compression ratio engines. The cost of reducing CO2 emissions – less than €30/g/km – along with the engine’s fuel savings are a guarantee of attractive vehicle prices and contained cost of ownership. The benefits of 48V hybridization complement those of the VCRi with regard to future emission targets, with the prospect of extending engine production tool lifetimes. VCRi can be used by any manufacturer worldwide. VCRi can run on all types of fuel without sacrificing performance for efficiency, thereby giving access to a wider number of markets with the same engine hardware. The use of carbon-neutral synfuel will benefit from VCRi’s multifuel capability. This, coupled with the reduced number of required variants in a VCRi engine family, is a solid basis for expecting significant reductions in development / production costs and time-to-market. VCRi features all the requirements of an ideal VCR system from the point of view of thermal efficiency and performance, thus being a very robust and sustainable technology platform for current and future advanced ICEs, with a high potential for future advanced combustion models. The expansion ratio can be as high as the system’s maximum volumetric ratio, while the effective compression ratio remains high despite the use of Late/Early Intake Valve Closing strategies, which produce an effective compression ratio lower than the volumetric compression ratio. Technical and economic trade-offs between VCRi-Miller size, cost, and performance have resulted in a CR range of 8:1 to 18:1, giving a Brake Thermal Efficiency (BTE) of more than 35% across 75% of operating range, with a peak BTE of 40%. This dramatic enlargement of the “sweet-spot” area enables a reduced number of transmission gears ratios, reduces fuel consumption and emissions, delivers exceptional low-end torque and dynamic performances and improves noise, vibration and harshness. 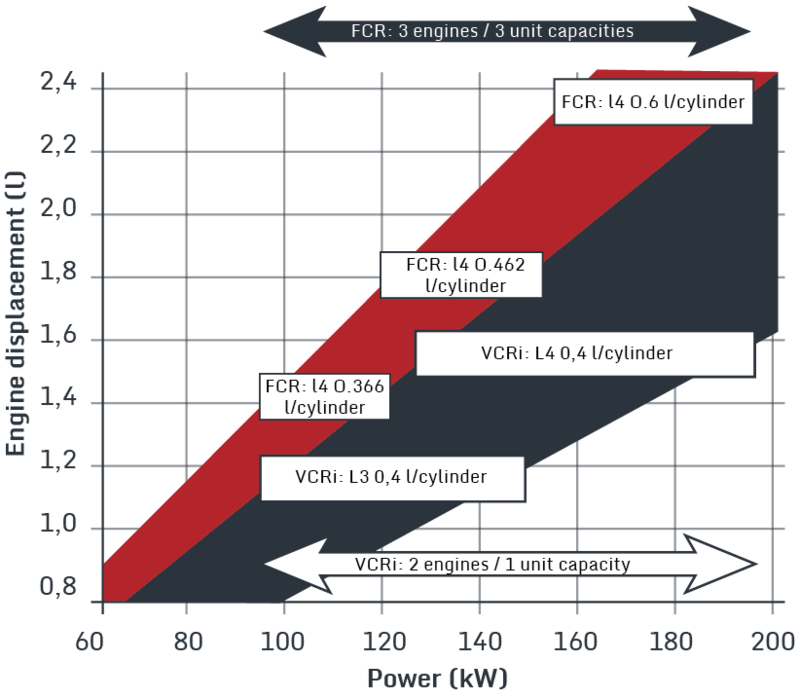 The VCRi engine’s compression ratio management means stoichiometric combustion means stoichiometric combustion can be maintained up to 120kW/l with no increase in exhaust temperature and no knocking, and the boost response time (turbolag) can be reduced without scavenging, making the VCRi a robust platform for complying with RDE (Real Driving Emission) regulations. MCE5 plans to increase the maximum BTE of VCRi engines to 44% through further combustion and boosting optimizations. In the longer term, close to 50% maximum BTE should be possible by incorporating homogeneous charge compression ignition (HCCI) and advanced lean burn combustion, for which VCRi cylinder selective capability and MCE5’s high energy ignition SSP technology, will be key enablers. RDE compliant VCRi-Miller engines have an optimum power density of 80-120 kW/l, while fixed-compression ratio engines operate at only 65-80 kW/l. 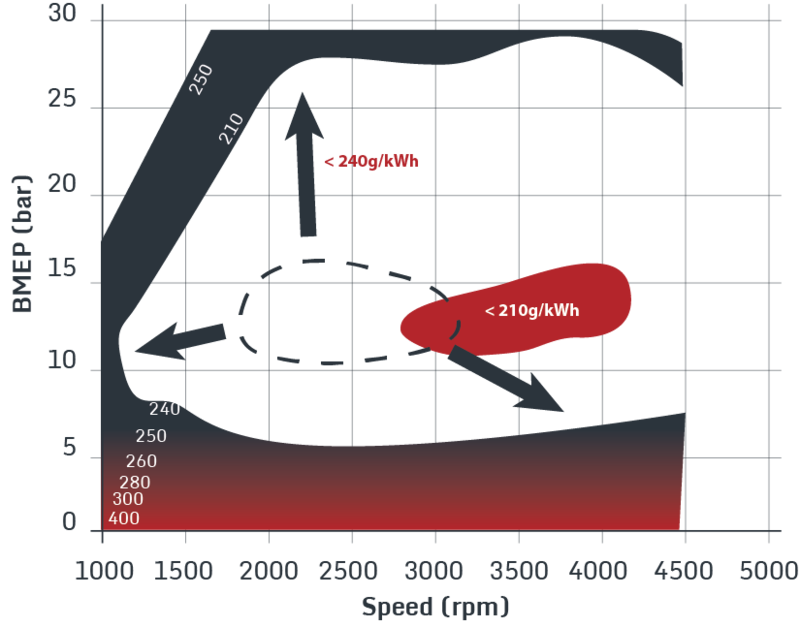 This, combined with a lower speed and the lower load sensitivity of BSFC thanks to the enlarged sweet spot, reduces the number of variants of engine-cylinder unit capacities required to meet a given power range in an engine family. A VCRi engine can run with widely varying fuel quality without compromising its energy and dynamic performance. The same engine hardware can therefore be used in many parts of the world. The low compression ratio used on VCRi engines enables faster initial heating of 3-way catalysts than is achieved with the higher compression ratio of fixed compression ratio engines, thus reducing catalyst light-off time. Reducing the compression ratio of a cold-running engine increases the distance between the injectors and piston crown, thus avoiding fuel impingement and dramatically reducing particle and raw emission generation. 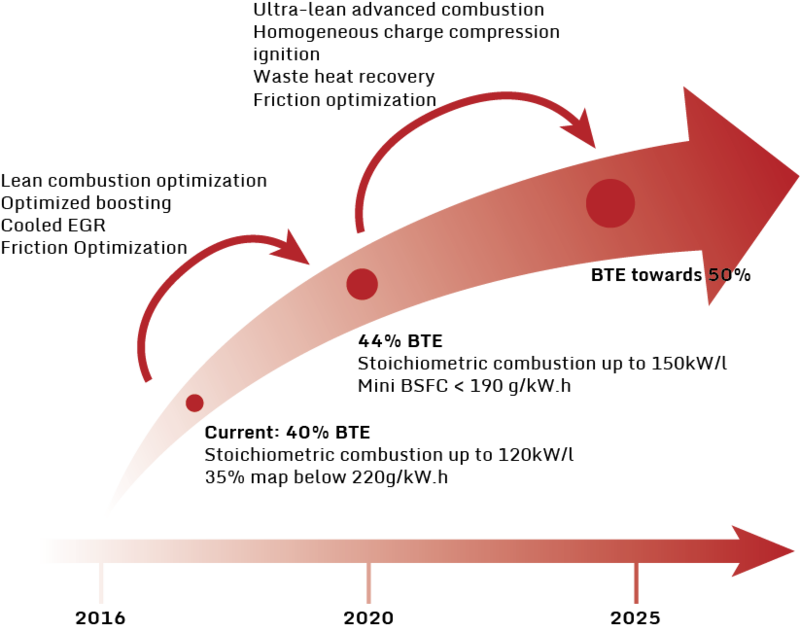 A low compression ratio enables high intake pressures without knocking, resulting in very high low-end torque and outstanding vehicle acceleration at low engine speed, while maintaining engine speed below 3000 rpm on regulatory cycles, thus resulting in lower fuel consumption and lower noise, vibration and harshness. Both the above effects are instantaneous during transients thanks to VCRi’s very rapid compression ratio change.